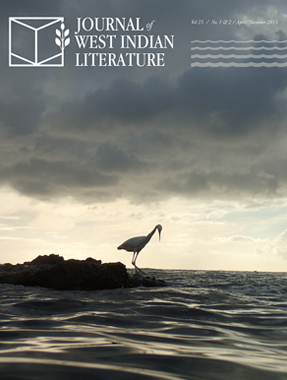 The Journal of West Indian Literature is now available online. Starting with Vol 23 , issues 1 & 2 (April/November 2015), JWIL will be fully online and available for purchase in PDF format. For a limited time (as in, go get it now now now) the first issue is available for free here. Below is more information from the editorial board about the journal, its history, the transition to online, and this special offer (TOC of free-for-now issue also below). The Journal of West Indian Literature has been published twice-yearly by the Departments of Literatures in English of the University of the West Indies since October 1986. Edited by full-time academics, the journal originated at the same time as the first annual conference on West Indian Literature, the brainchild of Edward Baugh, Mervyn Morris and Mark McWatt. It reflects the continued commitment to provide a regional and extra-regional forum for the dissemination and discussion of anglophone Caribbean literary and artistic culture. Initially featuring contributions from scholars in the West Indies, it has become an internationally recognized peer-reviewed academic journal. JWIL’s editorial board welcomes articles in English that are the result of scholarly research in literary textuality (fiction, prose, drama, film, theory and criticism) of the English-speaking Caribbean; comparative assessments of non-Anglophone Caribbean texts are also accepted, provided that translations into English of the relevant parts of such texts are incorporated into the submission. JWIL will also publish book reviews. In 2011, founding editor Mark McWatt celebrated JWIL’s twenty-fifth year of publication as a regional, UWI-led Caribbeanist project invested in highlighting and critically examining the prolific literary production of the Anglophone Caribbean. McWatt observed at the time that there was talk about the journal, which printed its first volume in 1986, “becoming exclusively an on-line publication” in the interests of international recognition and access. Of course, things moved slowly when the editors were all full-time academics juggling multiple responsibilities across the three campuses of the University of the West Indies, but only four years afterward, JWIL has indeed transitioned to an online platform. http://www.jwilonline.org/ is the journal’s first website, and it will be the platform for the first online volume: the double-issue Vol. 23 Nos. 1&2, which will appear in late December 2015, and will be open access for a limited time. This entry was posted in Announcements on December 29, 2015 by Kelly Baker Josephs.